In the last years, a spate of passenger deaths nationwide has prompted the enactment of tough laws to protect young people chartering limousines and party buses. Underage drinking has been a problem for years and the issue has started expanding more and more to the limousine transportation industry. Thus, an unfortunate trend has emerged across the US, in which young people charter limo buses or super-stretched limos and SUVs to be used as mobile nightclubs. In many cases, nobody checks the IDs of the passengers drinking alcohol in the limo, while also presumably believing that the person who chartered the vehicle is responsible for everything that happens in the passenger area. People used to believe that as long as someone of legal age purchased alcohol to be consumed in the limo, that person would be responsible if the limo was pulled over by the police. However, underage drinking in a limousine is ILLEGAL, no matter what state you live in and a reputable company WILL NOT allow it! You will not only risk losing your charter total, but you will also be arrested if you violate the law. Aall In Limo & Party Bus does not condone these actions and does not allow underage drinking in our vehicles under any circumstances. The existing law, called the Passenger Charter-party Carriers' Act, requires drivers of any limousine for hire operated by a charter-party carrier of passengers (carrier) under a valid certificate or permit to comply with certain requirements with respect to passengers under 21 years of age and alcoholic beverages. Chauffeurs and company officials also may be charged with a misdemeanor just for having alcohol on board a limo with minors if certain conditions are not met. The law was prompted following an incident in February 2010, when 19-year-old Brett Studebaker lost his life. He spent the evening drinking aboard a party bus in San Mateo, CA and, after exiting the bus at the end of the night with a blood alcohol content 3 times the legal limit, crashed his car into a wall. California State Sen. Gerald "Jerry" Hill introduced a bill in the State Assembly known as AB 45, or loosely known as the "Brett Studebaker Law", by December 2010. Although Studebaker died driving his personal car after drinking in a party bus, and not while he was onboard, there are plenty more similar incidents across the nation, which have made people question who is overseeing the limos and party buses. Read The AB 45 Assembly Bill Analysis Here! alcohol will be on that bus during the provision of transportation services. requiring such a passenger to sign the statement. AB 45 makes the designee or, if present, the parent or legal guardian, LEGALLY RESPONSIBLE for any reasonably foreseeable personal injury or property damage that is proximately caused by a violation of laws prohibiting the consumption of alcoholic beverages by a person under 21 years of age when alcohol is consumed during the time of transportation. The bill also imposes specified civil penalties for failure to comply with these certain requirements, based on the number of offenses, allowing for the conviction of a driver or any officer, director, agent or employee of the carrier for violations of the Vehicle Code. The law places impose a hefty fine of $2,000 for a first offense. Under this act, if a passenger who is under 21, after signing the statement, is found to be, or to have been, consuming any alcoholic beverage during the course of the ride, the contract of hire is immediately terminated and the driver must return the passenger to the point of origin. The original bill was amended 3 times in the State Assembly and another 4 times in the State Senate before being signed into law by Gov. Jerry Brown on Sept. 23, 2012, and implemented Jan. 1, 2013. Alcohol and parties are often synonymous for youth and hangovers, blackouts, vomiting, and even unconsciousness are accepted as part of the partying behavior, and even expected as part of coming of age. However, these are all examples of alcohol toxicity or poisoning, which can be fatal. Heavy drinking is prevalent among young people and is defined as 5 or more drinks on any one occasion. Drinking heavily over a short period of time will usually result in a "hangover", identified by a headache, nausea, shakiness and sometimes vomiting. These symptoms begin from 8 to 12 hours later. A hangover appears partly due to poisoning by alcohol and other components in the drink, and partly due to the body's reaction to withdrawal from alcohol. 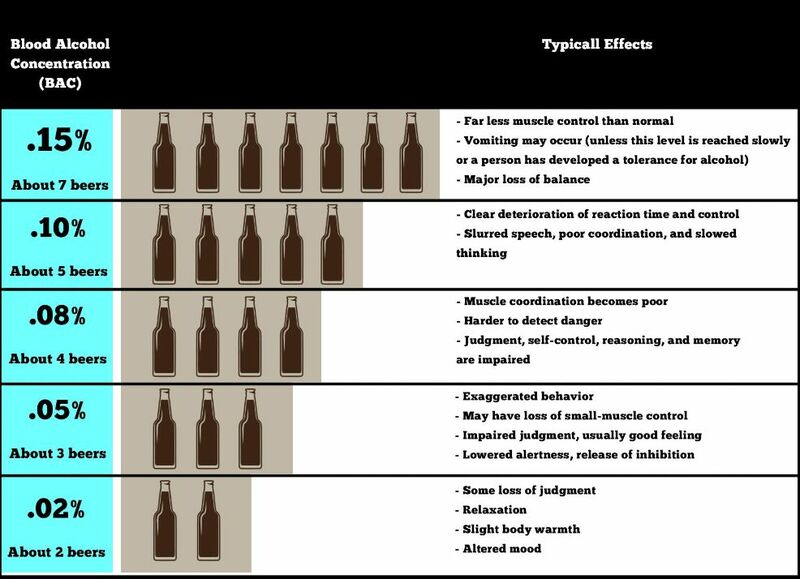 Alcohol is a depressant, which means that it will slow down and eventually even shut down the part of the nervous system that controls involuntary actions, like heart rate, breathing, and consciousness. After these vital brain areas have been 'turned off", coma takes over and can be soon followed by death. The brain's way of dealing with alcohol poisoning is sending a signal to your stomach to vomit, in an attempt to eliminate any unabsorbed alcohol. Eating before you drink will only slow down the speed of intoxication and there is no guarantee that you will be fine if you consume alcohol. Some people only vomit when they have consumed too much alcohol, whereas some people fall into a deep sleep and may never wake up. They either choke on their own vomit because they are too intoxicated to wake up and clear out their airway or never wake up due to the high concentration of alcohol, which completely stops their brain controlling life functions. The lethal dose that most authorities agree upon is at about .40%, or 4 times the current legal limit in most states. This, however, is no rule to follow: there have been deaths at much lower and in some cases much higher levels. NEVER let an intoxicated person "sleep it off"! Call 911 and request an ambulance for a possible alcohol overdose if the affected person is not responding to being woken up or if they keep on falling asleep. Read More Here! LCT Magazine has compiled these easy steps to follow when booking a limo with passengers under the age of 21.
ask the chartering party if alcohol will be served during the trip; if NO, there is no further action needed. if YES, ask if anyone will be under the age of 21; if NO, there is no further action needed. inform the chartering party that the designee will be legally responsible for any underage drinking and must be present at all times when alcohol is present. Talk about Safe Partying with Your Teen! Prom is a special occasion in many teens' lives, a time for celebrating the end of high school and the beginning of a more independent stage of life. Teens plan on drinking more during prom and usually end up drinking more than they have initially planned. separating from their good friends or the group in any way is an added risk for personal safety. Together with your teen, you should make a safety plan that respects your teen’s need for independence, while also presenting your bottom line for bringing your teen home safely in case things start to get out of hand. No underage drinking or possession of alcohol is permitted in any of our limos! In case this occurs, the Aall In Limo & Party Bus chauffeur may terminate the trip with no refunds and the minors will be dropped off in a safe location. There is a $300 minimum charge for vomiting (or other bodily fluids) in the limousine and $100 if gets only on the outside of the limousine. This is necessary due to the costly cleaning, and the time the car cannot be used. The job will immediately end and the client is responsible for the full amount of booked job. When someone is sick, the client must inform the driver immediately. If the driver has to find out for himself, the fine is doubled. We aim to provide nothing short of excellent customer service through our limousine transportation services and we do so by abiding by all the laws and regulations that apply to our industry. As San Diego County's best limousine service since 2005, we take great pride in what we do and hope to inspire others to act accordingly when dealing with underage drinking in limousines. Call or text us at 858.336.1894 for bookings and quotes!